The British Home Enhancement Trade Association (BHETA)’s consultative meeting with UK kitchen knife suppliers on March 25 reached a consensus to back a proactive industry-wide ‘responsible retailing’ campaign. Leading kitchen knife suppliers (including Taylor’s Eye Witness, Amefa, Fiskars, George East, Kuhn Rikon and Robert Welch Designs) met with BHETA’s Will Jones and Andrew Weiss to agree a positive way forward in the light of announcements from Asda (which is stopping sales of single kitchen knives and small knife sets) and Poundland (which has stopped all knives sales). The meeting coincided with an amendment to the Offensive Weapons Bill (as reported on HousewaresNews.net) meaning that responsible retailers who have adequate age verifications in place to prove that the buyer is over 18 and use an over 18 delivery service will be able to continue to deliver online sales of kitchen knives to domestic addresses. The BHETA meeting discussed a range of further actions including merchandising, packaging and point of sale innovations, retailer liaison, the continuation of political lobbying, consumer education and product development. It was agreed that a collective plan of action would be co-ordinated by BHETA aimed at promoting and ensuring best practice concerning the sale of knives through all the channels in UK retail. Will Jones, BHETA’s housewares sector director outlined the trade association’s plans. 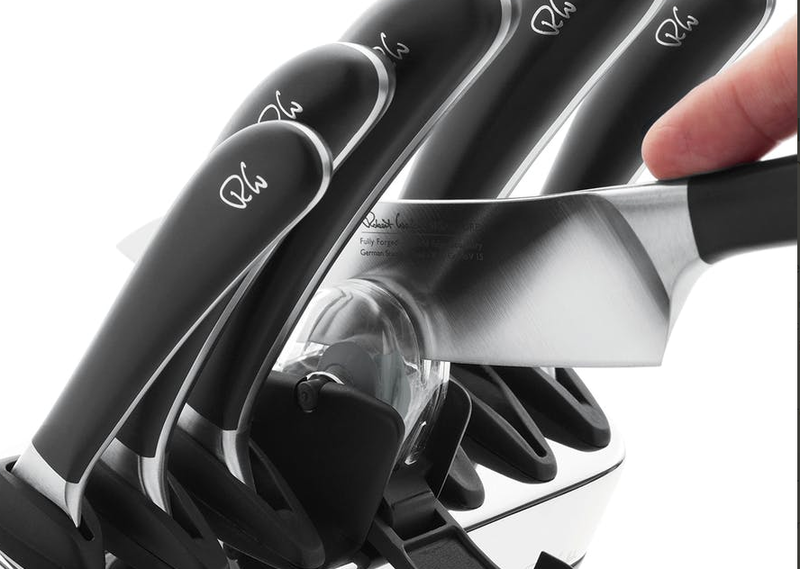 “In the light of Asda announcing its intention to remove single kitchen knives from sale, BHETA consulted with its kitchen knife supplier membership to share updates on lobbying to date, conversations with other leading retailers and product, packaging and presentation plans and proposals. At the meeting, several communications principles were unanimously agreed and BHETA is now pulling together plans for a combined stance on both retailing and communications. Our initial action in support of best practice will be BHETA writing to all major retailers to ask for their support and engagement moving forward. Above: Robert Welch Designs is among the companies that are working with BHETA. (Signature Knives Block pictured). “Knife crime is obviously a very serious and complex issue and it is vital that we play our part not only in addressing it, but equally in ensuring the industry avoids knee-jerk reactions which do not necessarily accord with the findings of the relevant advisory, enforcement and legislative bodies concerned. BHETA has been in dialogue with members for more than two years on how suppliers and retailers can contribute constructively to this increasingly political debate. Top: Kuhn Rikon was one of the knives suppliers that has come together with BHETA. Its Colori knives are pictured.